The parables and miracles that the evangelists have selected and presented in the gospels have spiritual meanings and messages. The blind man who sought the mercy of Jesus at Jericho was convinced that Jesus was the Messiah. Probably he was waiting to meet Jesus to ask for regaining his sight, because only the “Son of David” could do such a miracle. Considering his faith far advanced than those who have physical sight, Jesus offered him sight and salvation by saying, “Have sight; your faith has saved you.” The result was that he got sight and became a follower of Jesus. Our goal in life should be seeking eternal salvation through the spiritual sight offered by Jesus, the Light of the World. The Healing of the Blind Beggar. (35) Now as he approached Jericho a blind man was sitting by the roadside begging, (36) and hearing a crowd going by, he inquired what was happening. (37) They told him, “Jesus of Nazareth is passing by.” (38) He shouted, “Jesus, Son of David, have pity on me!” (39) The people walking in front rebuked him, telling him to be silent, but he kept calling out all the more, “Son of David, have pity on me!” (40) Then Jesus stopped and ordered that he be brought to him; and when he came near, Jesus asked him, (41) “What do you want me to do for you?” He replied, “Lord, please let me see.” (42) Jesus told him, “Have sight; your faith has saved you.” (43) He immediately received his sight and followed him, giving glory to God. When they saw this, all the people gave praise to God. All the Synoptic gospels (Matthew, Mark and Luke) narrate the miracle that Jesus performed to give eye sight to a blind beggar at Jericho. (Matthew 20:29-34; Mark 10:46-52). That shows that this event was popular or of importance to the early Christian community when the gospels were finalized. There are slight variations in the three presentations. 1. There could be two similar events that happened in Jericho. One that happened when Jesus entered Jericho and another when he left Jericho. This is not a widely accepted justification. 2. The blind man approached Jesus at the gate of Jericho when Jesus entered the city. Jesus did not heal the beggar immediately because Jesus might not have heard his cry at first, or tested his faith by not answering for a while. Jesus healed the blind man when Jesus was leaving Jericho to go to Jerusalem. 3. There was the old city of Jericho and the new city constructed by King Herod. The miracle might have happened in between the two cities. That means, it occurred when Jesus was leaving the old city of Jericho and was entering the new city. So both leaving and entering of the city could be correct. The Jews from Galilee while going to Jerusalem, avoided straight journey through Samaria because of their enmity with Samaritans. So they used to travel east crossing River Jordan and heading south. Again they used to cross back the River Jordan and passed through the city of Jordan to go west 18 miles to reach Jerusalem. Jesus was also passing through this city when the beggar approached him for healing his blindness. While Mark and Luke mention only one blind man, Matthew says there were two blind men. Mark even gives the name of the blind man as “Bartimaeus, the son of Timaeus.” The clarification of the interpreters is that there might have been two blind men as Matthew presents. However, one of them became a popular disciple of Jesus in the early church. That is why the evangelists focused on him and mentioned his name. The blind man had no other provision than begging. He had no family support. The roadside was the best place for him to beg for alms because the Jews were passing by Jericho to go to Jerusalem Temple for worship. (36) and hearing a crowd going by, he inquired what was happening. The blind man heard the sound of an unusual crowd passing by. The blind are believed to be more strong in hearing because those who lose one sense will focus more on the other senses. The crowd was passing to go to Jerusalem to celebrate the Passover. So a large crowd used to go during that season. An unusual crowd was formed because Jesus, who performed many miracles including the rising of Lazarus on the fourth day after his burial, was an attraction for the crowd to gather around him. The blind man was curious to understand who was passing by or what unusual thing was happening. His enquiry helped him to seek the attention of Jesus for his healing. Probably he was waiting for a chance to meet Jesus, who had been healing the blind, to seek healing for himself. Jesus (Joshua) was a popular name used for many Jews. To distinguish from others with the same name, people used to refer the name of the town where a person came from along with the proper name. Jesus spent most of his earthly life at a village called Nazareth in Galilee. So, he was also known as Jesus of Nazareth. Philip had introduced Jesus to Nathaniel calling him, “Jesus of Nazareth.” (John 1:45). Since Jesus became popular among the public with that name, the people who answered to the blind man said “Jesus of Nazareth” was coming by . “Son of David” was a Messianic title originating from the covenant God made with King David around 1000 years before Christ. When King David asked permission from God through Prophet Nathan to construct a house for the Lord, the Lord did not allow his wish. However, God made promises to David that He would fulfill it through his son (2 Samuel 7:12–17). Who was this son through whom the promises were fulfilled? They were only partially realized through Solomon, the biological son and successor of David. And the rest had to be fulfilled through the Messiah, the seed of Eve (Genesis 3:14–15) and a greater son from the lineage of David. Though Solomon built the Temple, the promise of God that “I will establish the throne of his kingdom forever” (2 Samuel 7:13) did not happen in the life of Solomon. He ruled only for 40 years and committed sin, especially during his later age. So God said, “If he does wrong, I will reprove him with a human rod and with human punishments.” (2 Samuel 7:14). This was only applicable to Solomon and not to the Messiah who was God who took human flesh. God continued in verse 16: “Your house and your kingdom are firm forever before me; your throne shall be firmly established forever.” Thus, “forever” is repeated thrice (verses 13 and 16) emphasizing the everlasting nature of the Kingdom of David’s grater son. Because of God’s promise to David that his son would establish his kingdom firmly forever, the Israelites have been hoping for an everlasting king from the line of David to sit on the throne of David and to rule the kingdom for eternity without any failure. God revealed this son of David through Angel Gabriel to Mary, the mother of the Messiah. “He will be great and will be called Son of the Most High, and the Lord God will give him the throne of David his father, and he will rule over the house of Jacob forever, and of his kingdom there will be no end.” (Luke 1:32-33). Matthew starts his gospel stating: “The book of the genealogy of Jesus Christ, the son of David, the son of Abraham.” The “son of David” is used 17 times in the New Testament for Jesus meaning that he was the promised and long awaited Messiah. The people acknowledged Jesus as the Messiah by proclaiming, “Hosanna to the Son of David” (Matthew 21:9) during his triumphant entry into the temple of Jerusalem. The physically blind man had spiritual sight to distinguish Jesus as the Messiah. Though the crowd introduced Jesus to him as “Jesus of Nazareth”, he loudly proclaimed that Jesus was the promised son of David. In the three Synoptic gospels, the blind beggar addressed Jesus twice saying, “Son of David.” That immediately caught the attention of Jesus. The blind man realized that it was the best opportunity for him to resolve his issue of blindness because only the Messiah could regain sight to a blind person. Isaiah had prophesied about the Messianic times: “And out of gloom and darkness, the eyes of the blind shall see.” (Isiah 29:18). Everyone else who had mercy on him, gave him money or food. Jesus had no money to give, however he had the power to heal him and forgive his sins that was believed to be the cause of blindness. (John 9:2). The crowd that went in front of Jesus tried to stop the cry of the blind beggar, probably because he was a disturbance for them. They wanted to listen to Jesus. Most of them who were coming from far away places might not have seen Jesus before, but had heard much about him, especially the unique miracle of raising Lazarus on the fourth day after his burial. Some others might want to silence the beggar because they were not happy that the beggar was addressing Jesus as “the son of David.” They were selfish and had no concern to get help for the beggar from Jesus. The blind beggar was assured that his last chance for recovery of sight was near. If he missed that opportunity, he could not regain it. So, he screamed to make use of his rare opportunity for healing. He did not care about what others might think of him. He repeated his faith in the Messiahship of Jesus by saluting him again as “Son of David. The blind beggar did not specify what kind of mercy he was seeking. Jesus wanted him to express his specific desire. Seeking mercy can be for any material benefit also. By the beggar’s request for sight, he was expressing his faith in the Son of God whom he believed had the power to regain sight for him. The blind man is an example for us on what to ask in our intercessory prayers. More than material benefits, we should seek the help of God to gain spiritual sight, so we can see how to enter the eternal kingdom of God. The request of the blind beggar reminds us of the story of King Solomon gaining supernatural wisdom from God. (1 Kings 3:4-15). After the king offered 1000 burnt offering at the altar in Gibeon, the Lord appeared to him in a dream and asked him what favor he wanted. Solomon humbly expressed his limitations as a little child and do not know how to carry out his duties. (Verse 7). “So give your servant a discerning heart to govern your people and to distinguish between right and wrong. For who is able to govern this great people of yours?” (verse 9). God was pleased with Solomon’s request and told him: “Since you have asked for this and not for long life or wealth for yourself, nor have asked for the death of your enemies but for discernment in administering justice, I will do what you have asked. I will give you a wise and discerning heart, so that there will never have been anyone like you, nor will there ever be. Moreover, I will give you what you have not asked for—both wealth and honor—so that in your lifetime you will have no equal among kings. And if you walk in obedience to me and keep my decrees and commands as David your father did, I will give you a long life.” (Verses 11-15). Since the beggar asked for sight and not alms, Jesus gave him physical and spiritual sight. He became a disciple of Jesus and probably a popular one among the early Christians. When we ask the Lord for our spiritual growth and eternal salvation, God will provide us whatever else we need. We do not need to present a long list of material benefits from the Lord. Along with giving physical sight, Jesus offered the blind man salvation. Salvation is a gift of God that we attain by faith. The blind man proclaimed in public his faith in Jesus as the “Son of David.” He responded to that call of Jesus by following him as a disciple. His blindness had turned out to be a blessing for him. Many who had physical sight could not gain salvation from Jesus because of the lack of their faith in spite of their ability to see Jesus and witness the signs and wonders he performed. (43) He immediately received his sight and followed him, giving glory to God. When they saw this, all the people gave praise to God. Jesus healed the blind by his words. The man who had seen Jesus only spiritually could then see Jesus physically. He experienced the power of the “son of David” in action in his life. He glorified God who did the wonderful healing for him. He expressed his gratitude by becoming a disciple of Jesus. 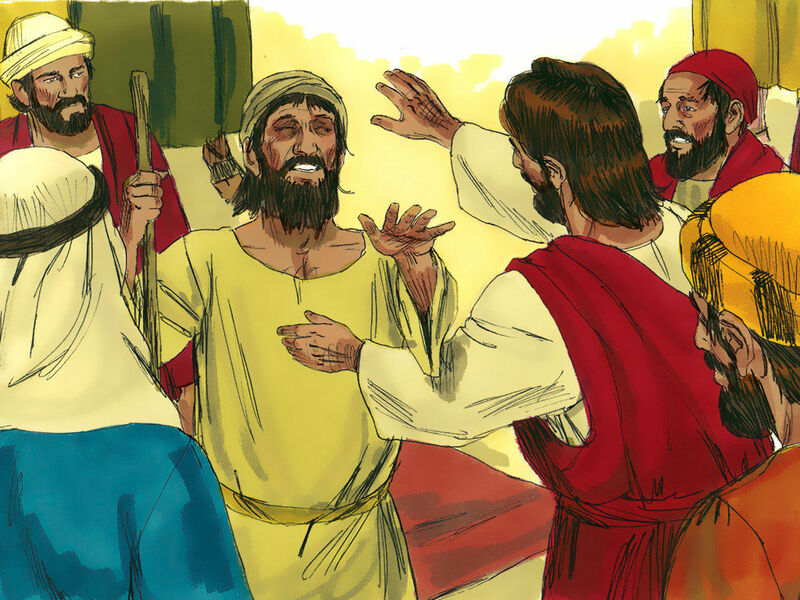 The blind man was instrumental for the crowd to witness one of the last miracles of Jesus who was going to Jerusalem for his last Passover observance and self-sacrifice. Many people who had heard of the miracles of Jesus, but never witnessed him performing, got a chance to see it happen with their own eyes. So, they glorified God. To glorify God means to acknowledge the splendor of the only one and true God, and give Him honor by praising and worshiping Him. 1. The blind beggar was spiritually far higher than those who used to give him alms. He had the spiritual sight while others were spiritually blind and could not recognize Messiah in Jesus. We shall not underestimate the less fortunate in the society. They might be more pleasing to God and might have a better place in the Kingdom of God than us. 2. The people who walked in front of Jesus rebuked the blind man to keep quiet. Our friends or others might discourage us from approaching Jesus or going to Church. The blind man got sight because he approached Jesus with his faith and did not yield to those who tried to discourage him from approaching Jesus. 3. Jesus sought the help of the people around him to bring the blind man to him. Jesus wants us to help him bring others to his church so that he can save them also. 4. In his public ministry, Jesus did not miss any opportunity to help others in need and those who came seeking his help. In our life journey to heaven, let us also make use of all possible occasions to help others. 5. To Jesus’ question of what he wanted, the blind man replied: “Lord, please let me see.” What do we ask to the Lord for us in our prayers? The beggar could ask for money, house, or any other worldly needs. He asked for a permanent solution to his issue. Our request to God shall be the spiritual sight needed to reach heaven. Our prayers for others also shall be the same. 6. Jesus told the blind beggar that his faith had saved him. Our salvation is also based on the practice of our faith in Jesus. 7. When the blind man regained his sight, he followed Jesus and gave glory to God. That encouraged others also to praise God. 8. Like Jesus, let us be compassionate to others and help them materially and spiritually. Let us also teach our children the lesson of charity and mercy. © 2018 ♦ Chicago, USA.